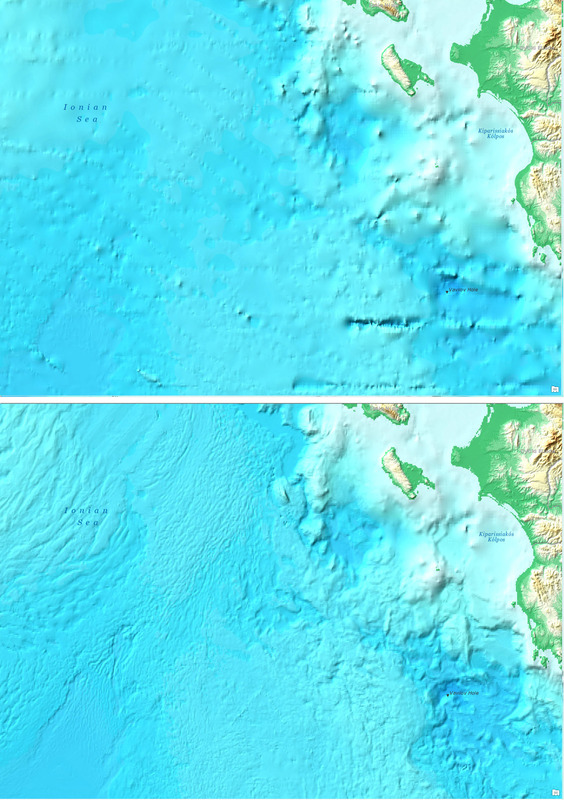 Esri’s World Elevation – TopoBathy Layer is enhanced with more detailed bathymetry datasets just in time for the Ocean GIS Forum. Let’s dive in for details about each dataset in this release. 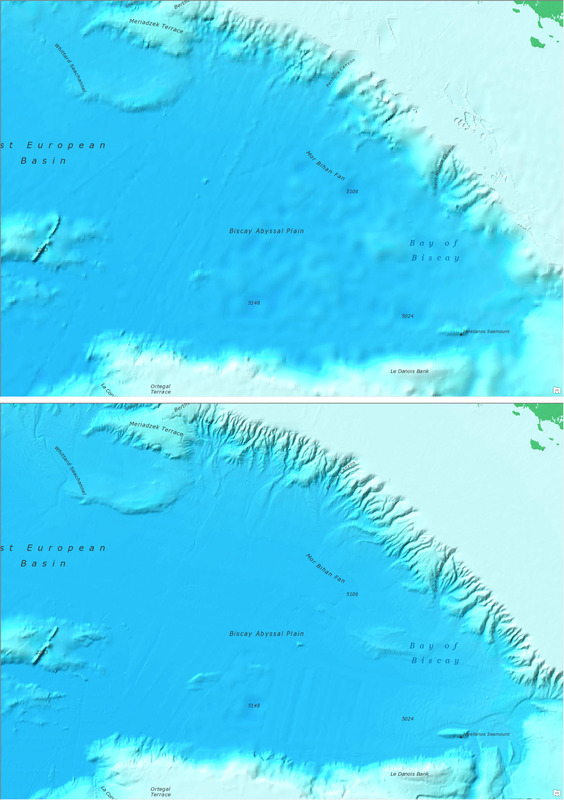 In this release, the global bathymetry source in TopoBathy layers is updated with General Bathymetric Chart of the Oceans (GEBCO) 2014 grid at 30 arc second (approx. 928 meters) pixel spacing, which adds many improvements over the GEBCO 2008 version. Major improvements are around the European waters, southeast of Japan, around Australia, along the coast of Chile and Atlantic coast of Northern Africa (Weatherall et.al, 2015). A few of these enhancements are depicted in the following images. A new deepwater bathymetry grid of the northern Gulf of Mexico at 40 feet (approx. 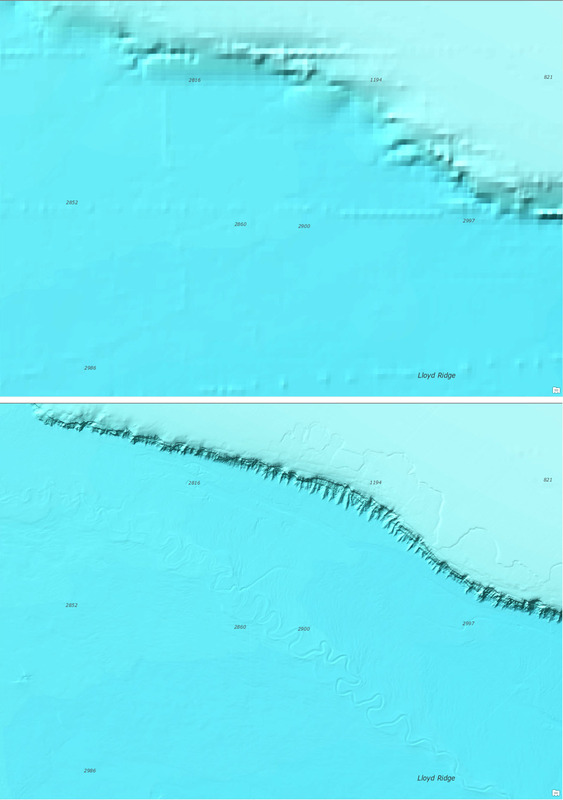 12 meters) from the Bureau of Ocean Energy Management (BOEM) is added which brings ~ 80 times enhancement in comparison to GEBCO in the areas of the salt mini-basin province, abyssal plain, Mississippi Fan, and the Florida Shelf/Escarpment. 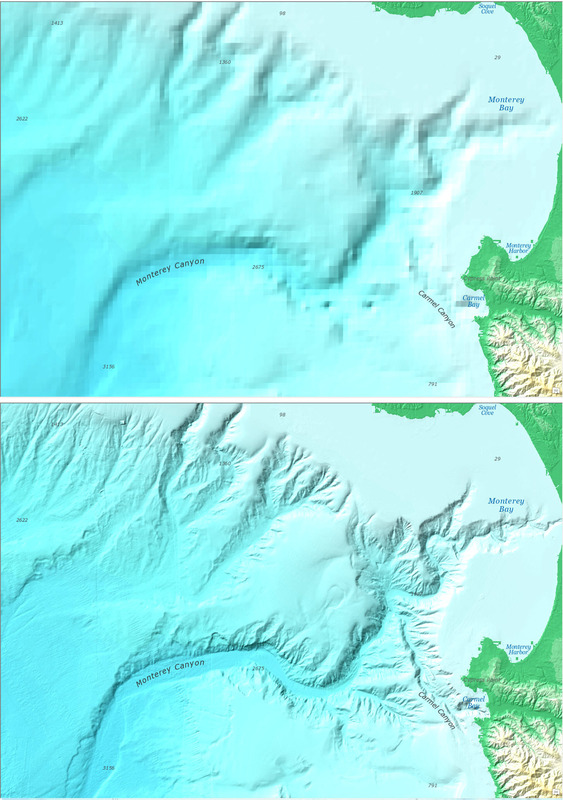 NOAA’s Southern California Coastal Relief Model (CRM) is added to the TopoBathy service, which provides detailed bathymetry at 1 arc seconds (approx. 30 meters) and 3 arc seconds (approx. 90 meters) resolutions bringing about 10-30 times more detail to the Southern California coast. The Australian government led the search operation for missing Malaysian Airlines flight MH370, and collected approx. 278,000 square kilometers of bathymetry data in the southern Indian Ocean, which was made public by Geoscience Australia. Phase one bathymetry data at 150 meters resolution adds 6 times more detail in this remote area of the ocean. 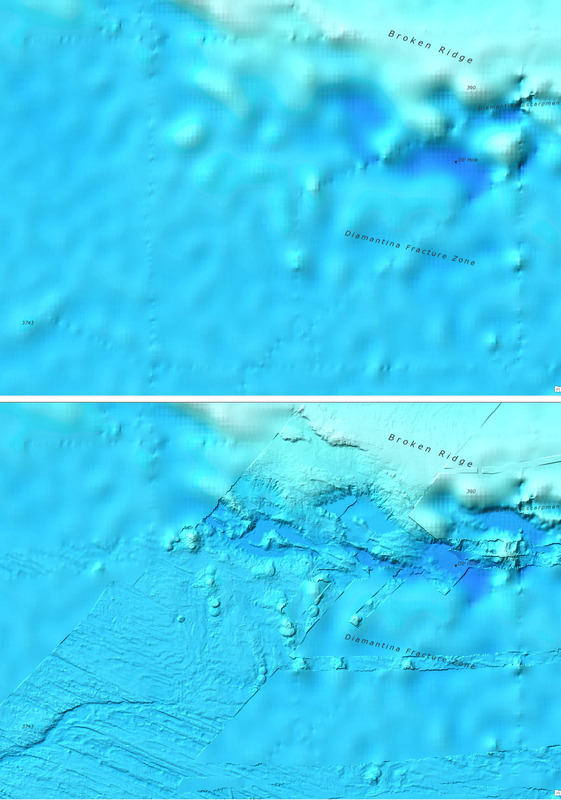 While the sole purpose of this search was to locate the MH370 flight, the detailed bathymetry shows distinct geological features such as Broken Ridge. 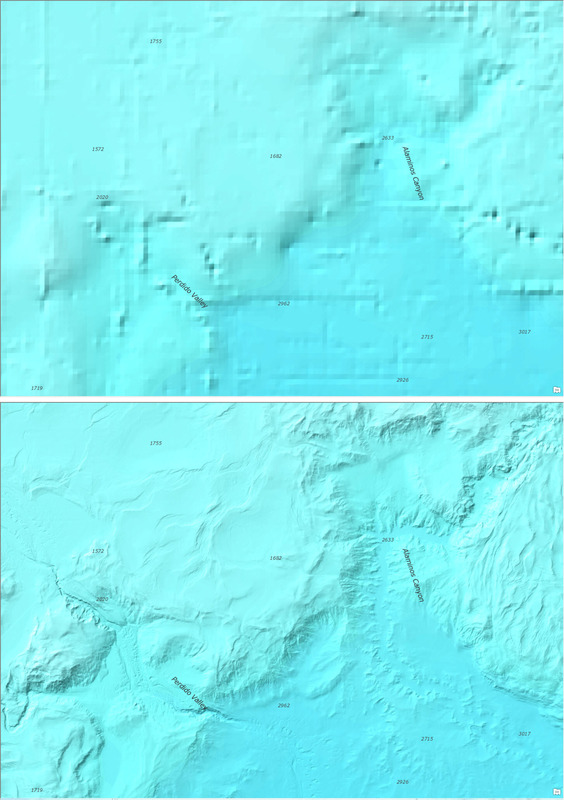 These bathymetry datasets are now available in World Elevation – TopoBathy service, which can be used for visualization (such as hillshade, elevation tinted hillshade) and analysis. A temporary layer can be generated using the Make Image Server Layer tool to be used as an input in geoprocessing tools to perform analysis. This tool allows you to define query, cell size, extent and output coordinate system for the temporary output layer. 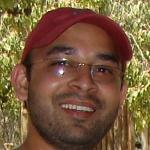 Each dataset in the service has a unique identifier and a query can be defined based on ProductName or Dataset_ID. For example, a definition query of “ProductName” = ‘GEBCO_14’ will filter data pertaining to the GEBCO grid only. World elevation layers are available free of cost to every ArcGIS Organizational account user. These bathy data updates will also be rolled out to TopoBathy3D in few weeks. For more information about the data coverage of the World Elevation services, check our Elevation coverage map. Additionally, to contribute high-resolution elevation data to Living Atlas of the World, check out the Esri Community Maps for Elevation program. Weatherall, P., K. M. Marks, M. Jakobsson, T. Schmitt, S. Tani, J. E. Arndt, M. Rovere, D. Chayes, V. Ferrini, and R. Wigley(2015), A new digital bathymetric model of the world’s oceans, Earth and Space Science, 2, 331–345, doi:10.1002/2015EA000107.